In the dying days of the Howard Government the United Nations General Assembly voted overwhelmingly to adopt the UN Declaration on the Rights of Indigenous Peoples. John Howard personally intervened to convince the new Canadian government to join the US, New Zealand and Australia as the only governments to register outright opposition to the adoption of the declaration. The Rudd Government is presently engaged in consultations before announcing its final decision whether to register an affirmative vote for the declaration. The declaration is not a treaty or international covenant. It does not require nation states to be signatories. It does not become part of the domestic law of any country voting for its adoption, carry with it any conditions requiring supportive governments to report periodically on compliance, or permit supportive governments to report violations by other governments. It is a largely symbolic document expressing the finest aspirations of and for indigenous peoples. We are now marking the 60th anniversary of the finest aspirational declaration of rights ever made by the UN General Assembly — the UN Declaration of Human Rights, which was backed up two decades later with covenants on civil and political rights and on economic and social rights. Opponents of the indigenous declaration point out that it differs markedly from the 1948 universal declaration. The indigenous declaration was worked on primarily by indigenous groups and not by national governments. Its strength and its weakness is that it lists the aspirations of politically active indigenous groups and not necessarily the aspirations of governments of nation states. It applies to indigenous peoples only but does not define who indigenous peoples are. And it places heavy emphasis on self-determination, a politically evocative but legally undefined term. A more tightly worded declaration would have done more to forge a moral consensus and to highlight real abuses. But even this loosely worded declaration could provide some amplification system for the still small voice. The four nation states that opposed the adoption of the declaration are post-colonial societies with indigenous populations. They pride themselves on being developed countries with a strong commitment to honouring the letter and spirit of any international instrument they sign. Their governments were worried that an unqualified right of self-determination for undefined indigenous peoples within their national borders could upset national cohesion and even threaten national sovereignty. Back in 1988, the Hawke Labor Government was happy to sponsor a resolution acknowledging the right of Aborigines and Torres Strait Islanders to self-determination subject to the laws of the Commonwealth of Australia. The Coalition parties in opposition would not agree to such a resolution unless the right of self-determination was further qualified by the rider 'in common with all other Australians'. Twenty years on, this is still the sticking point. Should the Australian government agree to an aspirational document with an open-ended recognition of the right of self-determination, which some think could lead to separatism or a capacity for one section of the community to act outside the mainstream legal system? Even if there not be such a broad based right of self-determination, should there be even an acknowledgment of the indigenous aspiration for self-determination? Or should the legitimacy of the aspiration, as well as the right, be circumscribed? Whether or not we change our vote at the UN, it is imperative that our post-apology government and parliament do more to work in partnership with indigenous Australians. The symbolism of reversing Australia's vote against the declaration needs to be matched by consultation, cooperation and agreement on any extension or maintenance of special measures in the name of intervention. Frank Brennan is a participant in the 'Options for the future of Indigenous Australia' stream of the 2020 Summit being held at Parliament House this month. On the heels of that momentous day 8 weeks ago, the federal govt is reported to be preparing to cut funding to Aboriginal legal services ("Broken promise will lead to legal aid cuts", Sydney Morning Herald, 31/3). As one SMH letter writer wrote, what indigenous Australians need most is a decent well-funded legal service. Now that's a barrow, Professor Brennan, that really is worth pushing. Frank's last paragraph is so important. So much of our attempts to assist indigenous people and for that matter people living in poverty in other countries, is interventionist and devoid of any real attempt to work in partnership. Partnership and self-determination must go hand in hand. Real partnership requires that each partners respects the other's wishes, desires and needs and cannot involve coercion. As the material rich and dominant partner it is so easy for us to believe, wrongly, that we know what is best for "them". We must learn to listen, learn from and respect indigenous people and by doing this there is a chance that we might be able to be genuine partners. This might sound easy but if the experiences of the last couple of centuries are anything to go by then we still have a long way to go. Another splendid piece that Eureka Street has given us. Thanks Frank. It seems to me crucial to recognise that Howard was determined not to recognise the right of our indigenous people to be members of their own race. His legendary stubbornness (in this case it was also monstrous wrongheadedness) meant forcing indigenous people (and all of us) to believe that their racial identity was absolutely secondary to their identity as "Assimilated Australians." Until we jettison this approach we cannot even conceive of what a just reconciliation might be. Frank Brennan notes that the four nations that opposed the Declaration are post-colonial nations with indigenous populations. Could it be that their opposition was founded upon a fear that their sovereignty could be compromised by acknowledging anything that is at all indigenous? If so, then Brian Haill is right to point to the underfunding of the Aboriginal Legal Service. Catholic Religious Australia has now called on the Australian government to adopt the international declaration. Fr Mark Raper SJ, President of CRA, says, 'Given this government's commitment to re-engage Australia with the vision, work and function of the United Nations, we request that Australia undertake the deep dialogue that will enable us to give meaningful acceptance of and support to the UN Declaration on the Rights of Indigenous Peoples.' Click here for more. Not all behaviour that offends religious beliefs amounts to vilification. However, when freedom of expression results in incitement to religious hatred, a line has been crossed. 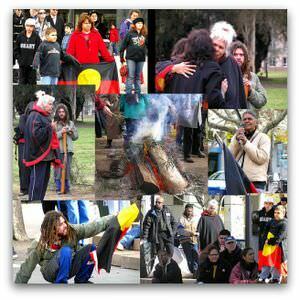 Symbolic gestures such as the apology to the Stolen Generations are often seen as a substitute for practical action. But sentiment provides important pathways into understanding the human impact of government policy-making.